Cobalt blue Sabah shoes. Image courtesy vendor. We bet you never expected you'd be obsessed with a pair of shoes from Gaziantep, Turkey. 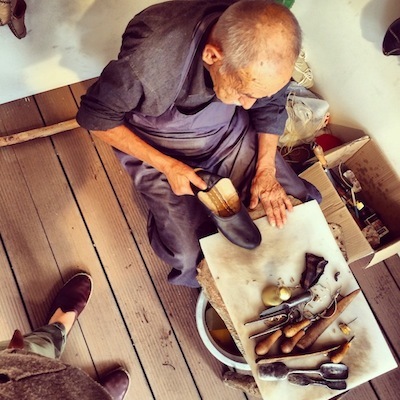 Master Craftsmen Mehmet Usta creates a pair of Sabah shoes in Turkey. What started out as Ashmore’s passion project has evolved into his full time gig. He quit his job at a hedge fund and spends his days expanding the Sabah brand. But it’s important to him to keep things “old school”—the shoes are only available through the Sabah website, and he isn’t interested in doing any retail. This also helps keep the shoes priced at a reasonable $170. Match the Gregory’s Shoe to the Celeb, Ctd.